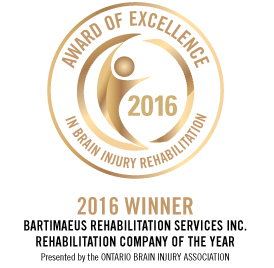 Bartimaeus Rehabilitation is very honoured to be the recipient of the 2016 Rehabilitation Company of the Year, awarded September 16, 2016 at the annual Awards of Excellence in Brain Injury Rehabilitation. This award is meant to recognize the private rehabilitation company that consistently provides exceptional and dedicated service to brain injury survivors, including through volunteer work by its personnel. We would like to extend our appreciation to Ontario Brain Injury Association and Personal Injury Alliance for providing this opportunity. Congratulations to all the nominees and winners of the awards.